After serving as a litigation associate with the firm of Baker & Hostetler, Professor Gilles joined Capital University Law School in 1990. Her scholarship focuses on First Amendment/Media Law issues. An innovative and enthusiastic teacher she is currently working with several co-authors on a Civil Procedure Rules student-focused publication. 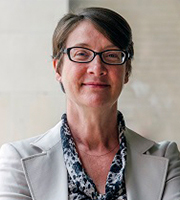 She serves on numerous law school committees (most recently chairing the Strategic Planning Committee) and is a long time adviser to the Women's Law Association at Capital University.